The day started out well with breakfast at the Not Justa CafÃ© in Bayport, about 16 miles east. I had one of the "Messes" which included hash browns, bacon, scrambled eggs, and cheese all mixed up. The place was packed as always. Our 6 year old grandson, Michael, had the 12" chocolate chip pancake with sausages and ate all but part of the pancake. The next event was our 12 year old, Mark's soccer game in Lakeport, about 40 minutes south. Mark's team is in the state finals. About half way through the game the rain started and came down hard. Up went the umbrellas and people put their chairs over their heads. 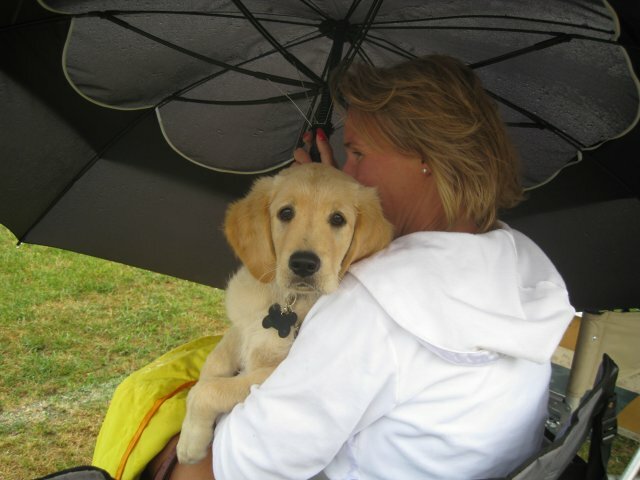 The puppy in the photo was well protected under an umbrella. It didn't hurt the game much and our team won. The prize for winning was to be in another game tomorrow.